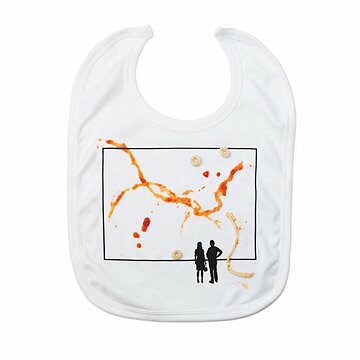 This bib lets you embrace your little ones spills and dribbles as Abstract Expressionist art. Every meal is a masterpiece with this clever cotton bib, designed as a canvas for artful spills, stains and dribbles. Printed with a gallery scene, silhouetted figures stare up at the day's art du jour. A fun and functional way to embrace the stain! Made in India, printed in the USA. All meals will now be masterpieces! Just a funny gift for the baby artists in your life. Perfect gift for creative parents! This was the perfect shower gift. It's a unique design--the parents definitely didn't receive more than one. Quality construction. I was very pleased with how soft the material is. I bought this as a gift for my expecting sister. It is so funny and cute! Messy eating turned into art! This bib is so fun. We have created a baby Picasso! Bought this for a friend who hasn't bothered to tell us she is even preggers. Baby Shower. love it! crazy over priced! Very cute! Bought this for an artistic couple we know that is soon expecting a baby. Cute idea. Totally broke the bank!